Shoei Finally has a Transitions Faceshield! The New CW-1 Photochromic. 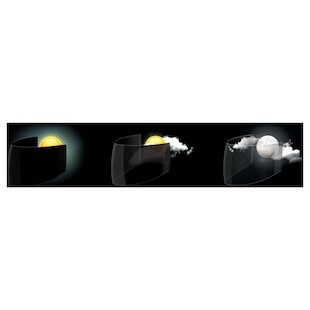 If you have ever been caught after dark without a clear faceshield, you understand how dangerous trying to ride home at night with a dark smoke shield can be. Bringing around an extra faceshield is pretty annoying. Faceshields are oddly shaped and can be scratched easily. Riders who work at RevZilla usually try to leave at a certain time to commute in the daylight with their smoked shields. We are at the whim of the sun. The sun can bite me. Instead of pulling over to swap out faceshields, rock a photochromic jawn. Photochromic is not a filter on Instagram. Photochromic technology allows visors to automatically and seamlessly change from clear to dark in the sunlight. There are only a few photochromic faceshield options and if you did not dig the helmet, you are out of luck. Add the Shoei RF-1100, Qwest, and X-12 to the short list of helmets that have a photochromic lens. The Shoei CW-1 Transitions Faceshield darkens when photochromic dyes embedded in the shield react to UV light. Without the UV light, the chemical reaction reconverts the molecules to their original state. This means that you don't have to bungee cord an extra faceshield onto your bike. Forget about having to pull over and switch out faceshields. Take that sun!